Giewont is very good as one or half-day trip. If you start and finish in Zakopane the trip will be about 1000 m high and 13 km long (see on mapa-turystyczna.pl). There are also two mountain huts on the trail leading to Giewont (Kalatówki and Hut at Hala Kondratowa) so if you start there, a trip will be very short. Accessibility for people who don’t have good condition, nice views from the peak, characteristic shape and good visibility from Zakopane make Giewont very famous. 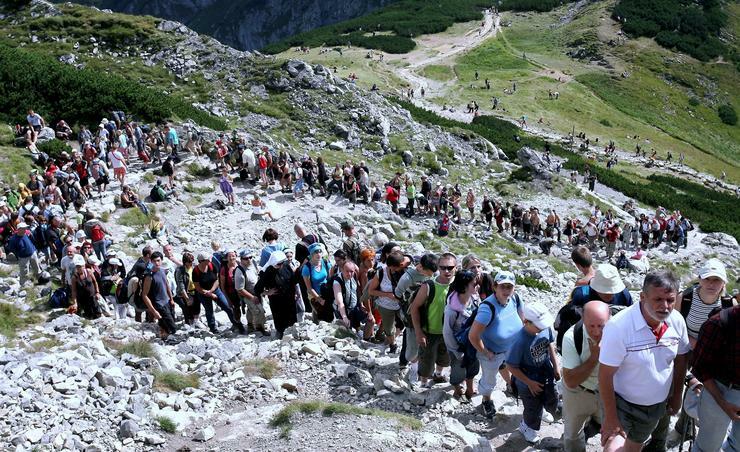 Every tourist wants to stand on Giewont and everyone wants to have a photo with 15 m high cross at the peak. Trail leading to Giewont isn’t difficult but below the peak, at about 1850 m starts a little harder part. It is secured by chains and if you have fear of height for sure it will be scary for you. Hardship is caused also by slippery stones so you have to be careful there even if there’s dry. To avoid crowds I took a trip to Giewont on the second half of September, on Friday (the photo above I made from Sarnia Skała during different trip, in July). Despite it wasn’t high season there was so many tourists, that we have to wait until some of day descent to be able to stand on the top (the summit is small and not many people can be there at the same time). It was also hard to ascent and descent fast, because of queue and many beginner tourists. Do you want to know how it looks like at high season? Here is another photo, from talajkowski.wordpress.com, a blog of 11-year old boy. A huge stoppage created there. Because normal tourists standed in queue circling the peak and dodgers after entering the summit immediately were going to the cross. So the queue stood in the place and people began to push against each other. (…) Generally scenes at Giewont were the same as in some poor movie: loud jokes and laughter, shouts at children, mutual pretensions of ugly pictures etc. (…) As for the photos, unfortunately many tourists did not understand, that everyone would like to have a souvenir pic. So, when they grabbed to the cross they did not want to leave. However, finally I was able to sit next to the cross. I just wanted to say thank you very much for your blog and for sharing what is for me very valuable information about the polish tatras. I plan to spend some time there, so for me, as an english speaker, your articles are like gold mines because there is not so much information in english. What hiking trails do you recommend ? I like trails which are wilder, not like the one you described in the article :)). Actually I was at hut Hala Kondratowa 2 weeks ago but there weren’t so many people. Thank you for kind words :) I’m happy that my blog is usefull. I haven’t walked whole Tatras yet but generally in Poland Western Tatras (eg Tomanowa Valley, Małołączniak) are less crowded and Slovakia Tatras are less crowded than Polish. Beside Giewont, most tourists walk between Morskie Oko and Palenica, on Kościeliska Valley and Chochołowska Valley.